LA County coroner sells own line of merchandise - Washington Times. LOS ANGELES | The morgue is about the last place you would think of to go shopping, so it's perhaps unsurprising that sales at Los Angeles County's coroner gift store are next to dead. Tucked as unobtrusively as possible in a closed-door room off the coroner's lobby, the store is jam-packed with mortality-mocking merchandise: Water bottles marked "bodily fluids," boxer shorts dubbed "undertakers," toe tags, crime-scene tape and beach towels bearing the county coroner's trademarked symbol of a body outline. Trouble is, few people know about the tongue-in-cheek store and its related website, Skeletons in a Closet (www.lacoroner.com/). The shop's biggest customers? No shock here -- homicide detectives. "Most people know it through word of mouth," said Craig Harvey, the department's chief of operations. "But we are mentioned in guidebooks and we get tourists." Illinois Funeral Scam- Government vs Association-YourFuneralGuy. « Yourfuneralguy’s Weblog. In the Illinois Funeral Directors Association Scandal it has come down to the State Government verses the Illinois Funeral Directors Association. This does not place the odds in favor of the Funeral Directors Association. The Association does look like the bad guy for misappropiating, misusing, stealing, between 59 Million and 100 million dollars. Austin Daily Herald | 'Solar' customers land rebate checks. Kelly Lady was a happy energy services consultant for Austin Utilities Monday. Lady visited Good Earth Natural Foods, Jay C. Hormel Nature Center and Worlein Funeral Home and handed out rebate checks Monday for their participation in Austin Utilities’ Solar Choice program. Every unit of electricity produced by solar is a unit that does not need to be produced by burning fossil fuels. Surveys have shown that most people prefer solar electricity over other forms of energy production and want to see solar energy used on a greater scale. Freethought San Marcos: In these economically tough times, a bit of relief | San Marcos Mercury. This is not information most people get excited about. After all, no one likes to contemplate using the services of a funeral home. That’s one reason the funeral business is called the “dismal trade” by some. But in December, two long-time funeral directors at Pennington Funeral Home left to form a new funeral service for San Marcos families -– Goodnight & Snell Funeral Directors. The principals, John Goodnight and Jonathan Snell, are offering a full range of lower-cost funeral services to families in the San Marcos area from their location at 101-B Centerpoint Road, just west of the outlet malls, near Hunter Road, in the Centerpoint Business Park. The new funeral service is next to an allergy clinic, adjacent to two churches (one of which is available for use for large funerals or memorial services), and near a construction company office. Goodnight & Snell’s prices are moderate, the lowest offered in San Marcos, based on the most recent funeral price survey done each year by the Austin Memorial Burial & Information Society, AMBIS. Cemetary's first sod to be turned 'next year' - Local News - News - General - The Canberra Times. The ACT Government expects the proposed southern Canberra cemetery and crematorium to cost more than $10million and wants to begin work next year. The Cemeteries Authority Board has identified 220ha of land near Fadden and Macarthur which could be used for the 50ha cemetery. It includes the former site of the controversial Tuggeranong data centre and power station. The board will carry out a feasibility study on the project, with community consultation to begin late this month. Metro Times - News+Views: Grave debate. Thomas Lynch and Lisa Carlson have a lot in common. Both are published authors, are popular among their peers and have public followings. Both are widely quoted "experts" in their field. Both seem to view their work as a calling as well as a profession. Both eloquently, rationally and convincingly address issues related to death, hoping to reach an American public that is often in denial, reluctant or ill-informed regarding end-of-life arrangements. But Carlson, a watchdog of the funeral industry, and Lynch, a Milford funeral director whose family owns six funeral homes in southeast Michigan, have publicly disagreed for more than a decade, often discussing and debating their points of view in the media and at conferences. They know each other. They read each other's work. They disagree over numerous points, from the meaning of death to what ceremony and customs should accompany it. But, mainly, they clash over the extent to which the law should dictate the role of funeral directors play. Now their dispute has moved into the courtroom. City Room™ - Chicago Matters - Chicago Matters: Death on the Green Plan. Nine million of us live in the Chicago area. And one thing’s for sure: we are all going to die. What you may not know is what happens to all those bodies, and the effect they have on the environment. Chicagoland cemeteries take up thousands of acres. Biodegradable Coffins - New York Times. This July, when Jorgi Wu was laid to rest in central California, she became the first American to be buried in an Ecopod — a 100 percent biodegradable coffin made of recycled paper. 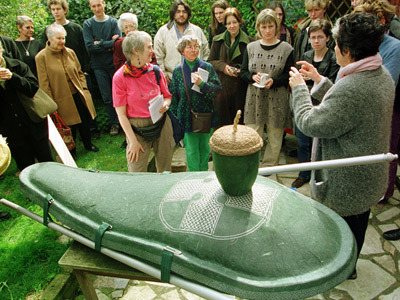 The seedpod-shaped coffin is designed to be planted in the ground, dissolve and replenish the earth with its nutrient-rich contents. Who needs embalming, cement vaults or herbicide-based lawn care? Eco-friendly burial now an option - Salt Lake Tribune. Imagine you or your loved one buried simply, in a plain pine box without the use of toxic embalming fluid and laid to rest in a place in harmony with the native landscape. Memorial Cemeteries and Mortuaries -- the first funeral company in the state to offer a "green burial" option -- can make it happen. 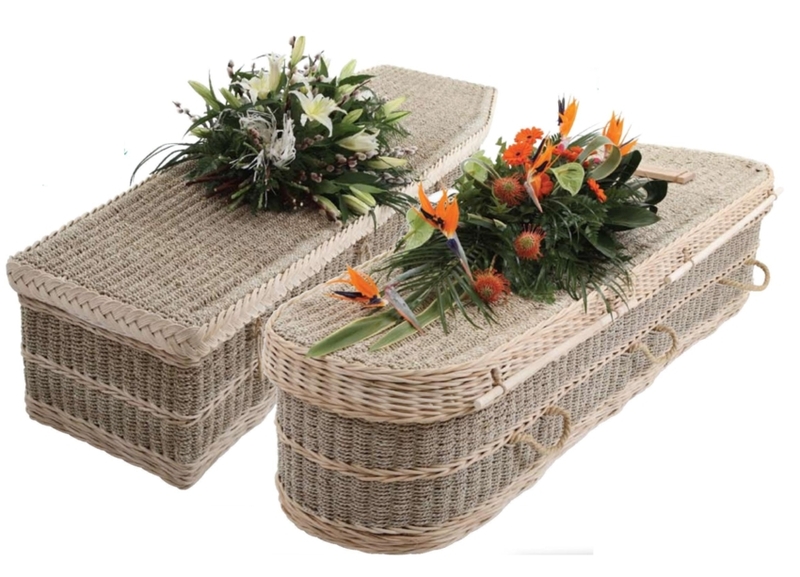 They promise an eco-friendly funeral with a biodegradable casket. So far, Memorial has set aside one area, in the foothills above Bountiful, which meets the criteria for a green burial ground. However, a green funeral may be followed by burial in a conventional cemetery at any of memorial's seven locations including Redwood Memorial Mortuary at 650 S. Redwood Road. If you go to pay your respects to someone buried at Royal Oak Burial Park's green cemetery in Victoria, you won't see any tombstones. In the park-like glade bordered by pines, you'll locate the grave with a GPS device. 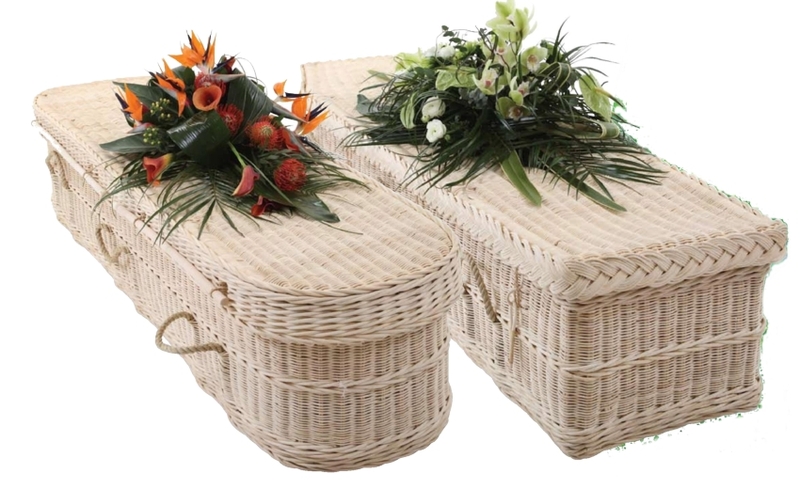 The dead haven't been buried in coffins, but instead were put into the ground - without being embalmed - in caskets made of biodegradable materials such as wicker, bamboo or even cardboard. Families can plant trees and wildflowers over the grave, and as the site fills up, it will gradually return to a forest. Royal Oak is the first cemetery in Canada to respond to the interest in green burials. "Green" burial options gaining popularity - News- msnbc.com. Indianapolis - There's a new way to bury a loved one in Indiana as the green movement is now affecting even the final resting place. It's the one experience everyone will face someday. 'Death midwife' as funeral alternative - Los Angeles Times. With money tight, many families are holding funerals -- even burials -- at home. Specialists help out with the paperwork and other details. Reporting from Washington -- When Jerrigrace Lyons goes out on a case, she carries a basic set of tools: makeup kit, cardboard caskets and a handbook with practical instructions for icing and transporting bodies. 5 Questions: One final green deed | argusleader.com | Argus Leader. Chapel Hill Funeral Home & Crematory has been offering green burials for only a month, but Doug Houseman already has had three dozen inquiries about it. "We've had a pretty fair amount of interest," Houseman said. "The green burial has been something that's been discussed in our industry a little bit. ... The basic idea is to be as green as possible." THE SHROUD OF MARIN. (29-AUG-05) The New Yorker. How much rest do the dead require? Late this spring, two experts were discussing burial theory over lunch at a Japanese restaurant in Mill Valley, California. The elder man, Ron Hast, had just visited Fernwood, a new "green" cemetery on the edge of town owned by the younger man, his friend and protege Tyler Cassity. Hast is an avuncular fixture in the funeral industry. In his earlier days in Los Angeles, in the sixties and seventies, he invented the Casket Airtray, which enables corpses to fly home in style, and he ran a service that provided mortuaries with embalmers and pallbearers, men known for their navy-blue suits and perfect manners and prepossessing youth. When Marilyn Monroe and Gary Cooper and Clark Gable died, Hast's men helped compose them for their final closeups. Now in semiretirement, at sixty-six, Hast edits and publishes the magazines Mortuary Management and Funeral Monitor. Concrete burial vaults divide traditionalists, environmentalists – Daily Commercial News. PETER KENTER correspondent MISSISSAUGA, ON Which specialty construction trade buries almost 15 million tonnes of concrete in North America each year — enough accumulated in total to build a concrete highway from Detroit to New York — because that’s what clients want? It’s the manufacturers of concrete burial vaults, a specialized business serving the funeral industry. Whether the use of concrete for burial is considered a valuable service or a waste of construction resources depends on your personal view of burial practices. “From our perspective, it’s just good, quality concrete being sunk into the ground that could be used for something more useful,” says Janet McCausland, executive director of Canada’s Natural Burial Association. Which specialty construction trade buries almost 15 million tonnes of concrete in North America each year — enough accumulated in total to build a concrete highway from Detroit to New York — because that’s what clients want? It’s the manufacturers of concrete burial vaults, a specialized business serving the funeral industry. Funeral Director Argues That Natural Burial Is Harmful To The Environment » GroovyGreen.com - Start Today :: Save Tomorrow. You know you’ve been sniffing a little too much embalming fluid when you argue that natural burials are bad for the planet. And yet, that’s just what a funeral director from New Zealand did while participating in a debate on the topic during a town council meeting earlier last month. Francis Day, of Marsden House Funeral Services, told the Nelson City Council that putrefaction of a body that was not embalmed would lead to higher toxicity levels in the surrounding soil to levels “which in many places would breach World Health Organization standards.” He continued that diseases and bacteria do not die when a person die but go right on living and could put “future communities at risk”. Like I said, a little too much sniffing. Such talk was immediately shot down by Mark Blackham, founder of the NZ Natural Burials organization. “The assertion that unembalmed bodies leave viruses in the soil is scientific ignorance at the least, and deliberate fear-mongering at worst,” he said. “Infectious disease-causing viruses and pathogens pass between living people and their excrement. These pathogens die with the host body within 24 hours. Funny enough, the funeral director claims to be all for natural burial — but just watching out for the “well being” of the community. Uh huh. Sounds like someone is a little upset that his customers won’t be forking over more than $7,500 per funeral anymore. And I would love to hear him explain how eco-friendly conventional burial is. 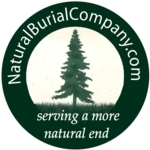 Eco-Afterlife: Green Burial Options: Scientific American. Entrepreneurs Reinvent the Funeral Industry. These trailblazers come from all sorts of businesses—automotive, design, technology—unburdened by the conventions of their new industry. They introduce products some consider shocking. Traditionalists scoff at them. But these outsiders are revolutionizing one of the world's oldest professions: the funeral industry. Link: ‘Natural’ burial ground opens to meet green demand - WalesOnline. The first “natural” burial ground in the Vale has opened. The burial ground, developed by Monmouth-based company Native Woodland, centres on land at St. Nicholas. The opening comes amid continuing concern about the lack of a conventional crematorium in the Vale of Glamorgan. The new natural burial ground is in a traditional meadow and pastureland at Coedarhydyglyn, off the A48 at the top of the Tumble, St. Nicholas. WASHINGTON - England's enigmatic Stonehenge served as a burial ground from its earliest beginnings, perhaps for ancient kings or chieftains, researchers reported Thursday. Radiocarbon dating of cremated remains shows that burials took place as early as 3000 B.C., when the first ditches around the monument were being built, said University of Sheffield archaeologist Mike Parker Pearson. Those burials continued for at least 500 years, when the giant stones that mark the mysterious circle were being erected, he said. Parker Pearson heads the Stonehenge Riverside Archaeological Project, which has been excavating sites around the world-famous monument for five years. He said the burial patterns support the idea that Stonehenge served as England's grandest Neolithic family cemetery. Link: LJWorld.com / City explores creating ‘green cemetery’ option. Peonies adorn a hillside Friday at Oak Hill Cemetery. The city’s Parks and Recreation Department staff is considering creating a new green cemetery area at Oak Hill. In a green cemetery, the dead are buried without the use of embalming fluids in a biodegradable casket or blanket, and traditional headstones aren’t used. Instead, a tree or a patch of wildflowers, for example, would mark a gravesite. Link: Charter for the Bereaved. # It is your right to be made aware of all known environmental issues relating to bereavement services. (Full details are given in the reference copy of the Charter for the Bereaved). # It is your right to receive a service that recognises your needs, without unfairness or discrimination eg religious belief, ethnic needs, disability etc. # It is your right to organise a funeral without the use of a funeral director. # It is your right, as executor (or next of kin), to be given the body by a mortuary, hospital etc in order to carry out a funeral. # It is your right to be given a leaflet by your Charter member describing how to arrange an independent funeral. Link: Obit Magazine | Going to Ground. Coffin saleswoman Cynthia Beal is bullish on the Ecopod. Long after the advent of biodegradable packaging, here’s the last package you’ll ever need. 'Green funerals' feature biodegradable coffins - CNN.com. PORTLAND, Oregon (AP) -- Cynthia Beal wants to be an Oregon cherry tree after she dies. She has everything to make it happen -- a body, a burial site and a biodegradable coffin. art.green.coffins.ap.jpg Cynthia Beal with an Ecopod, a biodegradable coffin made out of recycled newspaper. "It is composting at its best," said Beal, owner of The Natural Burial Company, which will sell a variety of eco-friendly burial products when it opens in January, including the Ecopod, a kayak-shaped coffin made out of recycled newspapers. Biodegradable coffins are part of a larger trend toward "natural" burials, which require no formaldehyde embalming, cement vaults, chemical lawn treatments or laminated caskets. Advocates say such burials are less damaging to the environment. Cremation was long considered more environmentally friendly than burials in graveyards, but its use of fossil fuels has raised concerns. Eco-friendly burials have been popular in Britain for years, but industry experts say it's starting to catch on in the U.S., where "green" cemeteries hosting natural burials have sprouted up in California, Florida, New York, South Carolina and Texas. The majority of eco-friendly burial products come from overseas -- including the Ecopod, which is made in the United Kingdom -- although there are a few domestic makers. 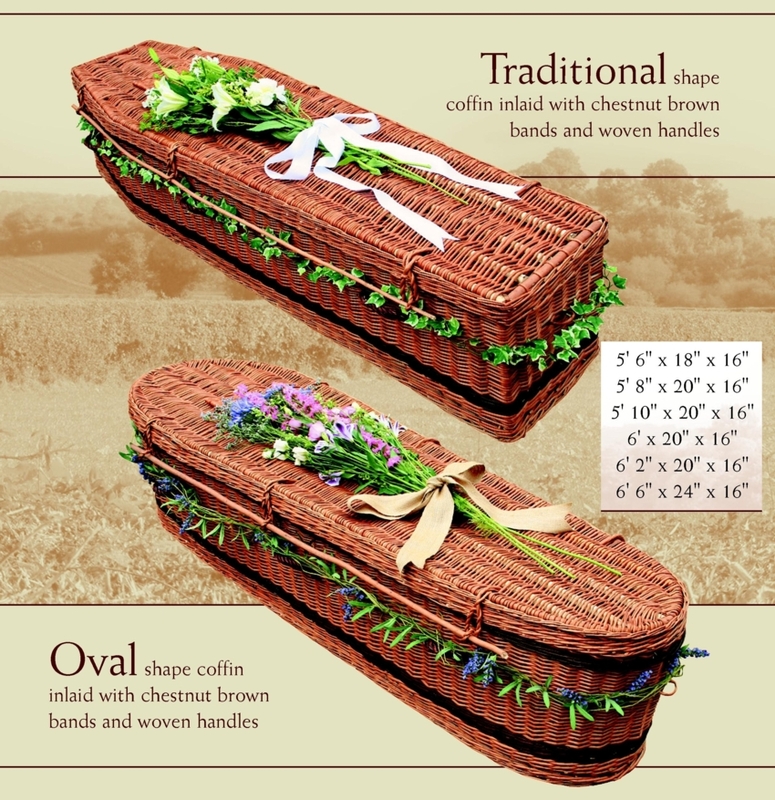 Options range from natural-fiber shrouds to fair-trade bamboo caskets lined with unbleached cotton. There are also more traditional-looking handcrafted coffins made of wood certified by the Forest Stewardship Council. The market is potentially huge. U.S. funeral homes generate an estimated $11 billion in revenue annually and that figure is sure to grow as baby boomers age. There are already specialty funerals, featuring caskets with custom paint jobs and urns with the insignia of a favorite team. Industry experts say eco-friendly funerals are just an extension of such personalized end-of-life planning. Biodegradable containers cost from around $100 for a basic cardboard box up to more than $3,000 for a handcrafted, hand-painted model. "It's hard to tell if it's a fad or if it's here to stay," said Bob Fells, of the International Cemetery, Cremation and Funeral Association. "We are certainly positioning ourselves that if this is what the community wants, we are ready to serve them." The Green Burial Council is working on certification programs to verify the commitment and quality of providers who say they are going natural. "What we are trying to do is to make sure this concept doesn't get 'green-washed' down the drain," said Joe Sehee, the council's founder and executive director. Take this pop quiz to test your knowledge about what is, and isn't, permitted As reported in the July 2000 Issue of the Bulletin MFDA learned that the FTC was supposed to make surprise undercover inspections in Minnesota to ensure that funeral directors were complying with the Funeral Rule. Regardless of whether the sting operations occur, all licensed funeral directors are required to comply with the Rule at all times. This pop quiz may refresh your knowledge by providing real-life scenarios in which the Rule must be applied. Scott Gilligan, the National Funeral Directors Association's General Counsel, developed this information. Link: Green Burials - KQED QUEST Television Story. Tired of toxic embalming fluid, rain forest wood caskets and other ecologically unfriendly practices, a new generation of undertakers is attempting to green up the funeral industry with burials that go easy on the land. Environmental Science » Blog Archive » Going Out Green. Link: Environmental Science » Blog Archive » Going Out Green. Looking at the population clock from the U.S. Census Bureau, the U.S. population is at 300, 459, 889 people, and the world population is at 6, 565, 359, 655. Link: BBC NEWS | World | Europe | Sweden set for freeze-dry burials.